ARK is getting baby dinosaurs! If you ever played Final Fantasy VII, you’ll remember one of the great joys of that game was breeding chocobos. Figuring out what colour birds you needed to mix together to selectively breed the ultimate Gold Chocobo was an amazing venture in bird husbandry. If you yearn to do all that again, it looks like ARK is offering just that. 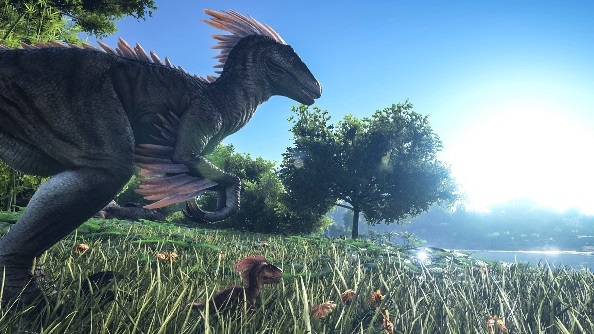 Is ARK one of our best PC games of 2015? Read our feature to find out! The new ARK update adds dinosaur breeding, where players can have two dinosaurs that love each other very much come together to produce an egg. The resulting child dinosaur will have a random selection of traits from both parents, along with a touch of mutation to make it completely unique. It’ll be a tough process, as raising the dinosaur to adulthood is similar in difficulty to taming an adult. But when it’s big and strong you can ride it into battle, and even use it as part of a long-term genetics program to selectively breed the ultimate dino. The update also introduces the Mosasaurus: a colossal underwater dinosaur that can be employed as a battleship. Take a look at the short trailer to see it in action. Yes, that’s a huge platform strapped to its back, which can be used for mounting ballista crossbows on. Even for ARK, this is a whole new batch of gleeful insanity.